Happy almost weekend! Any big plans for Father's Day? I have some great links to share with you today, but I hope you'll oblige me and let me know whether or not you'd like to me to continue with these Weekend Bloggy Reading posts. I have fun putting them together because I sometimes get to share blogs that might be new to many readers, and it also gives you an idea of what I love. I don't get many comments on these posts, but those of you who do stop by to "chat" with me seem to enjoy checking these links out. I'd love your input! ~Beth put together a Beach Snack Picnic Buffet and proved that you don't have to spend a ton of money to impress your kids. ~Must. make. Cheryl's. 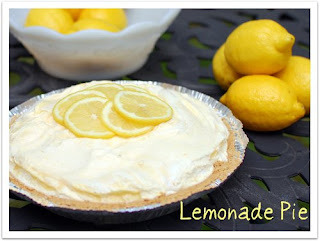 Lemonade Pie. ~Sarah shared some specific ways that you can receive some Comment Love for your blog. If you're a new blogger, this is a must-read! ~Paula showed her readers how to make a Ribbon Headband. ~Ashley showed us her Homemaking Card System. Genius! ~Stumbled across this cute project as I was returning comments this week. Check out this sweet Photo Tile Project. Not much going on here this weekend. Have to come up with something delicious for Father's Day, probably some time at the pool, and need to work on a long-procrastinated crafty project. Thanks for featuring me this week. I personally love that you post project links each week because it is a great way to discover new blogs. I posted a recipe today that you might like for Father's Day. I love these posts--you always have such great selections! You're the only person who features a variety of posts that captured your attention--not just one kind. Love that! Well,I'm new here, but I like your link suggestions! Thank you for sharing them! That lemonade pie looks so good and the comment post made a lot of sense. Inspiration posts full of lots of different ideas are my favorite kinds of posts...hm, maybe I need to do these more often myself. If you enjoy putting them together, keep posting them! I always enjoy links like this. I don't get many comments on my weekly round-ups, either. I think people are too busy visiting the blogs I recommended! I too enjoy the links!! Also remember it is summer now and many people are out laying in the sun or working in their gardens. I should be doing that too!! I love those tiles! Have a great weekend. I love them! It's always so fun to see new projects and blogs. I think you should keep them! I'm heading over to check that pie recipe out right now! Thanks. I like the weekend bloggy reading. I don't visit all the links, but I read through, and when something catches my eye, I hop over there to visit!